of a Skull, which is called in Hebrew, Golgotha. Is he King to you? When confronted with the Truth what is our answer? For a while I did not believe. God’s mercy and patience sought me and rescued me from sin. We can reject or inflict. If we reject him there is nothing else that can rescue us. Not my good works, not my money, not my name. If we accept him who has come into the world, we are released from out debt of sin and we inflict damage to the kingdom of darkness. Darkness will no longer have authority over us. I bow the knee. I repent and Hail Him King of the Jews and King of Liz! How many stamps am I worth? I’ve been awake for about an hour and just like that something triggered and brought to life these hidden gems, even made me smile. When I was a little girl living in the Bronx, I remember walking the streets under the raised train tracks. I can still hear the chuck-chuck-chuck rhythm in the background. I never second guessed the noises in the air. It was city life. Hand in hand with my mom we’d walk to our destination. One hand holding mine and the other in her pea coat pocket with her booklet. There was this Redemption Center that we would go to. We’d browse the front window and then walk inside. Based on how many stamps my mom accumulated; this determined the item we could take home. But what if we were missing a stamp? It was a lot of work to own anything on the window display in exchange for the stamps we collected. In never really amounted to anything big. The prize always seemed out of reach. What if the item or object is unattainable? What if my booklet is deficient in pages or the stamps that I collect are not enough? The Bible tells a story of this exact thing. Often sin is spoken as something someone else is doing. It’s the evil we see on TV. It’s the criminal that often repeats the offenses. Even a child is taught to share otherwise they grow up selfish. But, what happens when we grow up and are now mature? Are we now exempt? We’ve learned right from wrong. We’ve arrived. Right? Somewhere in our walk we have forgotten that the smallest of wrongs have accumulated. They have joined together to taint our behavior, actions and even our outlook on life. We have become familiar with the “noises of the world” that they don’t even affect us anymore. At least we don’t think so. Let’s go down memory lane again. Magilla Gorilla, do you know who he is? He spent a lot of time in a window hoping someone would redeem him; purchase him, love him and take him home. I remember thinking, poor gorilla. No one wants him. Sometimes we feel like that poor creature. Here I am! Someone, love me. We want to be loved and cared for. We feel the wrongs of yesterday have taken something form us. Perhaps we are right. Yet, there is a Redeemer that is quite familiar with all that we have done; all that we have lost. He longs to bring us home. His walk has been long. He has paid the price for the one he yearns for, you & I. You see, I have gone to the redemption center and brought out my booklet. I have a stamp for obeying my mom. I did all my homework. I did not steal the gum from the corner store. Oh, I did lie to my dad about that thing he said I should not do. 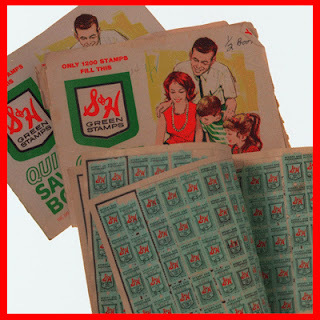 Can I still redeem my stamps? The Lord is aware of how many good things we have done. He knows we desire to do what is right but sometimes fail. Who will redeem us? Was this not the cry of poor Magilla Gorilla? Who will take this little girl home? The Redeemer said I am worth it! My debt was cleared. He said he would take me home. Jerome Avenue in the Bronx, the Redemption Center. The treasure was not always what was in the window. The prize is the great memory of being with my mom. Walking hand in hand. Secure &. loved. He did it once and for all. Hey, Jesus is coming over today! What would be the first thing we would do? Hmmm, perhaps clean the bathroom. Touch up the living room. Make sure there is something to eat. Oh, did you run the dishwasher? Pick up your dirty socks from the floor! Oh, no the guest room looks like a storage bin!!! The very familiar story of Mary and Martha. 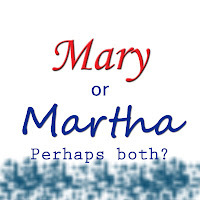 Martha often is seen as the “busy Martha”, so worried about the “house” when Jesus was visiting. According to the Lord’s comment, “Martha, Martha,” the Lord answered, “you are worried and upset about many things, but few things are needed—or indeed only one. Mary has chosen what is better, and it will not be taken away from her.” (Luke 10:41-42) Indeed she was preoccupied with other responsibilities. I wondered what she was worried about? What had her upset? Was it just the housework? Maybe the status of her heart was on shaky ground. Questions about life? Let's not be unfair. We have all been there. I’m not justifying that keeping busy doing “housework” is more important than sitting at the feet of Jesus. Perhaps there were troubles or doubt about her own soul? I’d like to say that after the Lord’s rebuke and revelation, I believe that Martha’s heart and outlook changed. When Lazarus dies who is it that runs to meet Jesus? Here we see her faith. I don’t believe that Mary was now preoccupied with other responsibilities, but both have now seen Jesus as their Master. Something deep inside has changed for both. Martha’s heart has been touched by the Lord. Martha may have been rebuked but she quickly learns “what is better”. We all have been Martha. We may be Martha right now. The lesson is to hear the voice of the Lord. To anchor to the direction he is pointing us to. He is the Way to Life! He knows our preoccupations and how easily distracted we get. We can’t make excuses for our neglect; our disregard what the Master is teaching us. We must realign ourselves to what is right. Sometimes we neglect to read the Word of God; guilty! When opportunities arise to share the Gospel, we might shrink back; guilty! Sunday mornings seem to be the best time to sleep and we want to stay home. The distractions of life are obstacles. They try to stop the transformation the Lord is working out in us. Way to go Martha!! God is so patient with us. The Lord is Messiah. He is the promised One. He takes the dead and causes it to live. Dreams, situations and circumstances that speak dissolution and strife; he turns them around. He hears when we call for help. He knows our weakness and yet he continues to pursue us. He knows our need for him and he waits in hope that we respond to his love. He gives us many opportunities to come and sit with him. He wants to lavish us with his love! So, what shall we do today? Have the dishes called to you? The dust is overwhelming! The dirty clothes have consumed me. Distractions, interruptions, commotions, and on and on. Sit at the feet of Jesus today. He can raise the dead to life; He is the Resurrection and the life! The housework will get done. He quiets the anxieties of life. When we have been filled and refreshed by the Word of the Lord, the rest of life becomes easier. Thank you Martha & Mary!